Be the first to share your favorite memory, photo or story of Sally Ann. This memorial page is dedicated for family, friends and future generations to celebrate the life of their loved one. 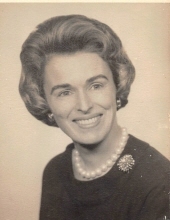 Born on November 22, 1925 in Chicago IL to Donald F. and Frances Ogden West McPherson, Mrs.
their married life in Lake Forest IL, where she was active in numerous activities and organizations. Sally Ann was an accomplished horticulturist who mastered the art of growing standards and topiaries. Women’s Golf Association and a longtime member of Onwentsia Club in Lake Forest IL. she encountered throughout her life with courage and grace. To plant a tree in memory of Sally Ann Ogden McPherson Isham, please visit our Tribute Store. "Email Address" would like to share the life celebration of Sally Ann Ogden McPherson Isham. Click on the "link" to go to share a favorite memory or leave a condolence message for the family.